The CSU is a particular case in German politics. On the federal government level, the party is part of the CDU/CSU fraction and thus of the German government. It acts as sister party to the CDU, but is more traditionalistic, conservative and currently takes a hard drift towards the right. The CSU is only running in Bavaria and has been ruling the Federal State since its foundation in 1945 (except for four years in the 1950’s). The CDU forwent from creating a fraction in the Bavarian parliament and in turn the CSU backs its policy on the federal level, plus it is repeatedly awarded government offices. Currently, though, the CSU behaves as sort of an opposition within the government as it consistently opposes the chancellor openly. Die Linke is the most successful left-wing political party in Germany. It’s a fusion of two major left parties. The Left was created in 2007 when the largest western German and the successor to the GDR’s SED-PDS merged. The SED-past of many members and of the party itself was often a source of criticism of the party’s policies. Die Linke itself is furthermore caught in a constant struggle between the moderates and the more radical members. Some of the party’s internal issues can lead back to its history. In some eastern German states, Die Linke used to be comparatively stable and was even part of state governments. On a federal level, the left never made it past the opposition. While the moderates have long tried to make the party an option for a coalition of SPD, Bündnis 90/Die Grünen and Die Linke, the AFD surprisingly manages to steal many of Die Linke’s votes in eastern Germany. The liberal FDP is a good example for the changeability of the German political landscape in recent years. Founded in 1948, the party was elected into all German parliaments since 1949, until 2013, when it didn’t manage to make the 5% threshold of the Bundestag. This event threw the party into a deep crisis, from which it, since then, is trying to recover. Traditionally acting as the number one junior partner for the CDU, the FDP managed to reach a few successes in polls and state elections, feeding hopes for the party to return to the German parliament in 2017. A lot has been written and said about the AFD. In its short existence, it managed to stir the political pot in the country, pulling voters from all other parties as well as the so-called protest-voters, and people who did not previously vote. Additionally, the AFD allied with the racist and islamophobe PEGIDA-movement. Since its foundation in 2014, it managed to get into 8 State Parliaments as well as into the European Parliament. The party started out as a mono-topical anti-Euro movement, but quickly turned into a hardline conservative and then an openly far-right party. But, maybe owed to the AFD’s relative youth, the party still doesn’t appear as a united body. Particularly in western states, the party seems a lot more moderate than in the eastern states. Compared to its youth and size, the AFD is extremely successful in making itself heard. The NPD, founded in 1964, is the unofficial successor to Hitler’s NSDAP. The party’s program is openly racist, and it has many ties to Neo-Nazis all over Germany. Just like Die Linke, it is under constant surveillance by the Office for the Protection of the Constitution. Over the course of its existence, there have been numerous attempts to have the party dissolved and prohibited by the constitutional court. 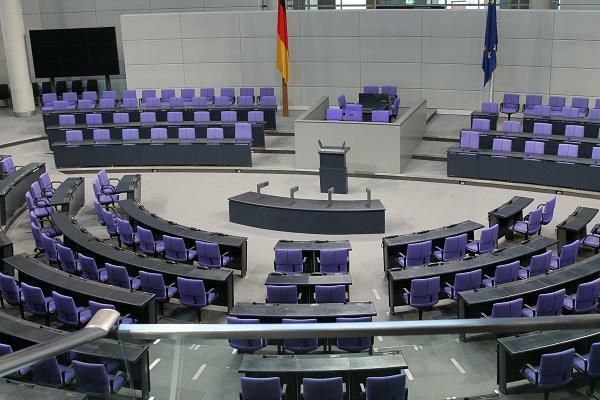 Recently the NPD suffered heavily under the rise of the AFD and has now lost all seats in state parliaments.